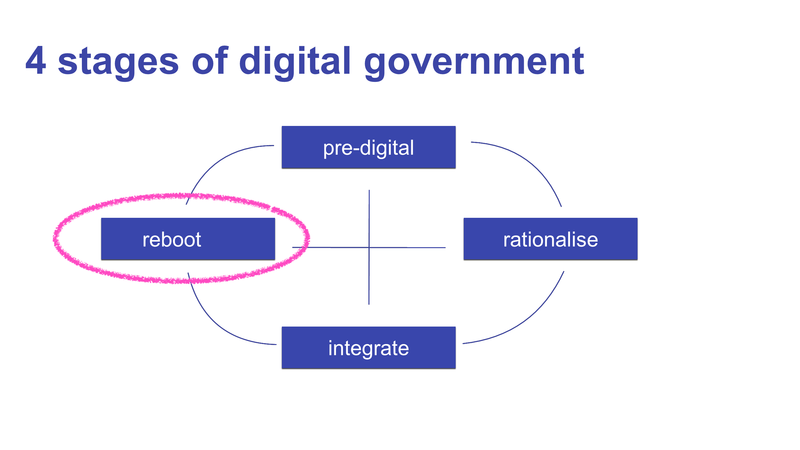 This is an energetic and challenging presentation on the state of digital government – or rather of digital government in the UK. It’s available in various formats, the critical thing is to make sure you read the notes as well as look at the slides. The first part of the argument is that digital government has got to a critical mass of inexorability. That doesn’t mean that progress hasn’t sometimes been slow and painful and it doesn’t mean that individual programmes and even organisations will survive, or even that today’s forecasts about the future of government will be any more accurate in their detail than those of twenty years ago. It does though mean that the questions then and now were basically the right ones even if it has been – and is – a struggle to work towards good answers. 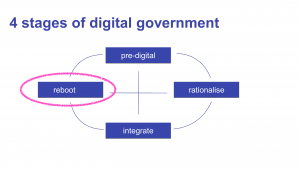 The second part of the argument introduces a neat taxonomy of the stages of maturity of digital government, with the argument that the UK is now somewhere between the integrate and reboot phases. That’s clearly the direction of travel, but it’s perhaps more debatable how much of government even now is at that point of inflexion. The present, like the future, remains unevenly distributed.